Gathered neck chemise (cămaşă încrețită), with sleeves open at wrists, decorated with vertical rows of black embroidery on front and sleeves. 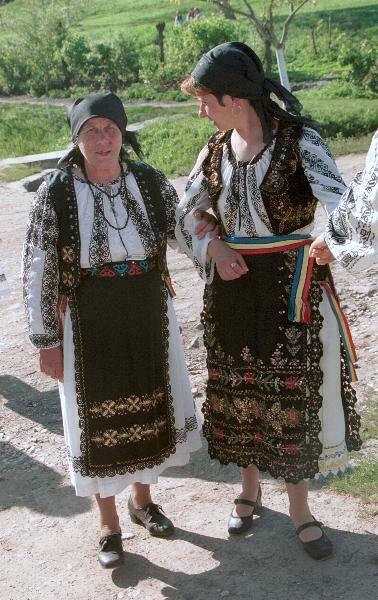 The chemise on the left has wide band of embroidery on the shoulder called an altiță. Black front and back aprons (catrințe) made of a single width of black woven woollen material, edged with black crochet lace, and decorated on the lower part with motifs in gold and red thread. Narrow fabric belt (brâu), woven in coloured wool (left), or made of ribbon in the colours of the Romanian flag (right). Waist length black velvet waistcoat (ilic) decorated with motifs in gold thread. White linen underskirt (poale) decorated with rows of embroidery above the hem and edged with white crochet lace. Black cotton head scarf. Photo taken in Miheșu de Câmpie, Mureș county, in April 2001.